Armdrop Inc. is taking it to the strip! Our group hosts drag racing, car & bike shows. We keep the old street racing spirit alive, no timing, no slips, armdrop start, race anyone you want! Step back in time at this unique event, see these classic and modified vehicles in action! Smell the rubber & octane in the air! This event is open to all street cars & race cars - No bike racing allowed at Picton (our insurance does not allow it!) but bikes welcome at our Shannonville events! Watch for special Shannonville events happening this summer!! DASH PLAQUES & TROPHIES! First 200 Drag cars get dash plaques. We have a variety of trophies for racers and also for show cars and bikes! No extra fees to enter the CAR or BIKE show. Just pay the $5 spectator fee! Cool Armdrop T-shirts available while they last! Restrooms & food vendors are also available. We are on the hunt for businesses that would like to sponsor this popular event! 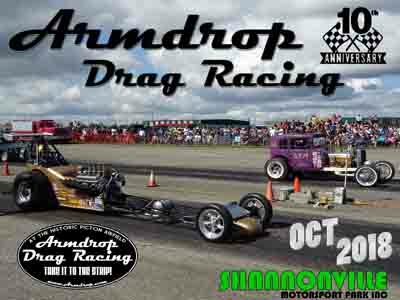 If you are interested in sponsoring please contact us at 613-539-5577 or info@armdropdragracing.com. Your business name/ad could be on t-shirts, flyers, tickets, dash plaques, trophies and other event items! Copyright © 2014 Armdrop Inc.